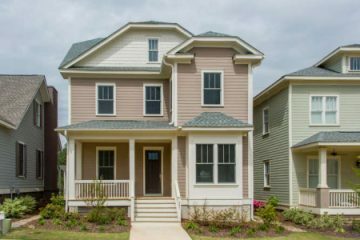 In the heart of Saluda River Club’s Village District, Blythe Building Company, LLC has completed a beautiful new home that is ready for immediate move-in. Located at 541 River Camp Drive, close to the Village Club – which includes a fitness club, meeting space and an adult pool – the $399,000 new home measures 2,481 sq. ft., and includes 3 bedrooms and 2.5 baths. It features a stone-clad fireplace in the family room, and a second fireplace outside on the back porch welcomes the family and their guests. Great to spend some relaxing times here on long fall evenings with friends – or a good book! 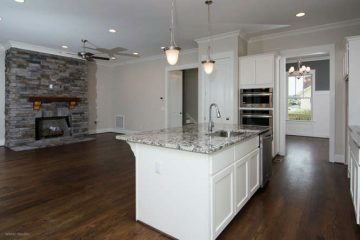 In addition to the quality construction homebuyers can expect when they are looking for their next home at Saluda River Club, this spacious new home enjoys beautiful luxury finishes throughout, one of the hallmarks of the fine craftsmanship by Blythe Building Company. These finishes include glorious hardwood floors that cover the entire downstairs, except for the laundry room. The bright, open gourmet kitchen is equipped with top quality, built-in stainless steel appliances, stunning granite countertops and lots of storage space. White cabinetry adds a fresh and elegant touch to the heart of this home. Upstairs, the master suite includes a large bathroom en-suite and a walk-in closet. Two other bedrooms and another bathroom are located on the same level, which makes this floorplan very attractive to a young, growing family. The Village Club is one of two clubhouses within Saluda River Club, in addition to the Chickawa Outdoor Center, and just one of the many top amenities available to the homeowners in the award-winning community. Miles of paved trails meander through all three Saluda River Club Districts (the River District, the Village District and the Woodlands District), and there is also a beautiful nature trail system. Blythe Building Company is a member of 2-10 Warranty and the Home Builders Association of Columbia, where Lee Blythe serves on the Land Development Committee and on the Green Building Council. He is also a Certified Green Professional, a member of The Better Business Bureau, and the Nation Home Builders Association. The family-owned and operated company, whose mission statement is “Building on Truth,” builds custom homes as well as market homes with quality products and true craftsmanship. To learn more about this well-built, spacious home in the Village District and other homes at Saluda River Club, please schedule a visit soon. For more information or directions, please call 803-358-3969 or visit www.saludariverclub.com.